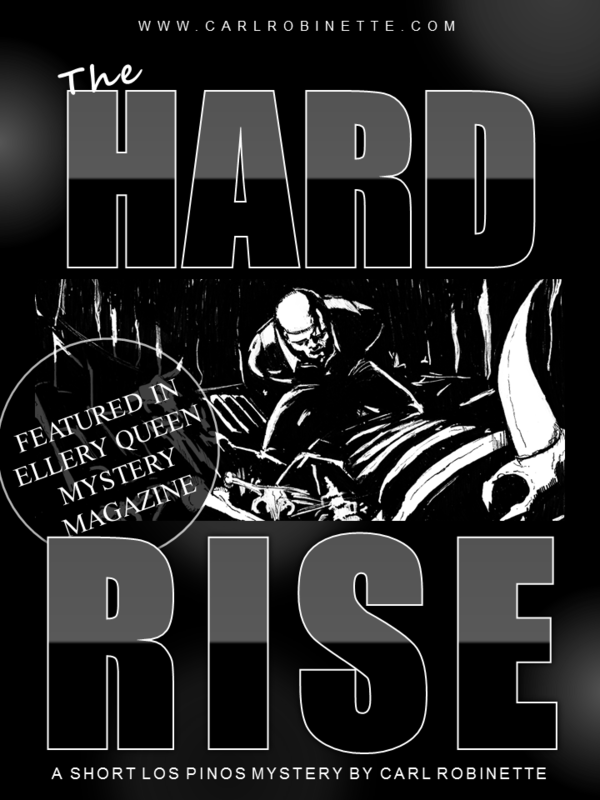 “The Hard Rise” by Carl Robinette is a short story, originally published in Ellery Queen Mystery Magazine. Grave robbers? Drug dealers? Smugglers? When Hank Garnier returns home from war to find Los Pinos County scorched by wild fire, he stumbles upon two men up to no good in a dry creek bed at night. Hank is all alone but he will go all the way to the edge to get to the bottom of things. When the stakes are life and death, he’ll rise to the occasion. Excerpt: “Hank Garnier turned his collar against the cold night air that came crisp out of the high Sierra in a way he had enjoyed as a boy. Now home after only so little time away, the cold breeze gnawed at him. He was squatted against his boot heels at the top of a small mesa where a white cross stood high overhead, glowing blue-sliver in the half full moon, isolated from the foothills in an empty cow pasture. There was an old campfire smell on the wind from the fires that had burned California in the hot dry months of early fall, leaving the entire broad side of the foothills dead and black. Hank blew into his hands, eyes fixed downhill on the far wall of a mostly dry arroyo where the glow of yellow lamp light danced against the creek’s vertical bank. Occasionally a shadow flicked across the warm glow. He watched the light down in the arroyo and told himself, don’t let curiosity get you going off, sticking your nose where it doesn’t belong. Remember how that ended last time. Hank Garnier had shot and killed an armed and hardened outlaw at fourteen years old in defense of his own life. He’d been a local hero all through high school because of it and even now, before he’d been back in town more than two hours, a man from the little local paper phoned Hank, saying he wanted to do a story on the sharp kid of Los Pinos, home from war without a scratch. Hank told the guy, the last thing he needed was his name in the papers again. The last thing he wanted people to call him was, War Hero. He swung his legs off the mesa’s volcanic cap and moved down the slope, drawn forward by the light. When he was close enough, he heard two distinct voices that came only as hollow vowels in the open air of the countryside. One voice, a gruff shot-caller kind, spoke more than the other voice which was in a slightly higher register but still ragged and mean. Still its own kind of deep voice, and it was arguing with the shot caller the way a child argues with a parent. The gunshot cracked the night. “The Hard Rise” appeared first in Ellery Queen Mystery Magazine (March/April 2017 Issue). It is the second story in the Hank Garnier series about a young man in 1960’s rural California. When Hank Garnier shoots a knife wielding criminal to death at the age of 14 in the first story (“The Hard Type”), his life is directed in search of something he lost that day.